Gudrun Heinz, a teacher graduated in fine arts and textile handcrafts, focuses on patchwork, quilting and other techniques of textile art since the early 1990s. Organising competitions which are followed by touring exhibitions is one of her favourite jobs. In 2005 she launched the first small format challenge "Funny Textile Inspirations". Three further competitions followed. For information about "Textile News: Freiheit ∙ Liberté ∙ Freedom" click here, please. new! 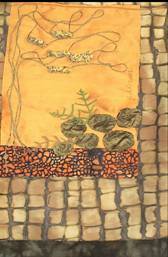 The last one, entitled “Textile News: Langeweile. Boredom. 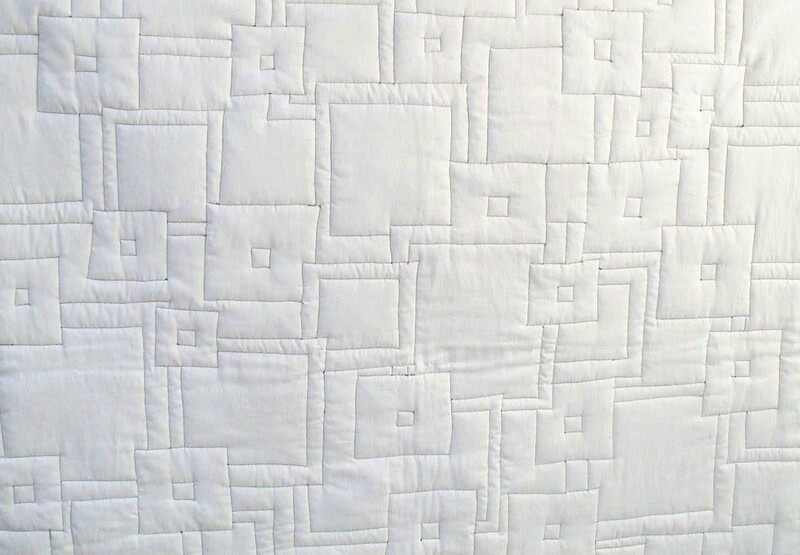 Ennui.”, was premiered within the Festival of Quilts in Birmingham (England) in August 2013 and is since then touring through Europe. Her quilt “Demenz / Dementia” won the 2nd prize in 2009 when she participated in “Yesterday – Today – Tomorrow”, an international competition patCHquilt had organised to celebrate their 20th anniversary. This was the starting point for another more ambitious project entitled “Zeichen der Zeit / Signs of the Times”. Gudrun invited a number of well-know European artists to take part in this prestigious exhibition which has been opened in May 2012 within the Patchworktage, the annual event of the German patchwork guild, held in Einbeck (Germany). “Zeichen der Zeit / Signs of the Times” was also on show within the 18th European Patchwork Meeting in Ste Marie-aux-Mines (France) in September 2012, within Prague Patchwork Meeting, Prague (Czech Republic) in April 2013 and in Luxembourg from May - September 2013. Gudrun is very pleased to act as an exhibition designer and being asked for judging textile art, e.g. "Tradition bis Moderne IX", 2011, a competition of the German Patchwork Guild. Mini-Quilt-Challenge "Eco", 2011, Sofia (Bulgaria). Various competitions within the Prague Patchwork Meeting 2012 (Czech Republic). "Dreamgarden", a competition within Quiltfestival Riga 2012 (Latvia). She was asked for lecturing at International Quilt Forum Saint Petersburg 2011 (Russia) and in October 2012 at Quilt Symposium in Saint Petersburg (Russia). Besides this Gudrun Heinz teaches classes, writes articles and reviews, designs catalogues and is asked for organising competitions (e.g. “ART Jacquard Inspirationen”). Her postings on BERNINA blog, predominantly about textile artists, exhibitions, events and her quilt journeys, are most appreciated. Gallery Belyaevo in Moscow (Russia) invited her to show own work in September 2011. This solo exhibition entitled “Gudrun Heinz – Perspectives” became a great success. An exhibition tour ensued, including different venues in Russia, Quilt Expo en Beaujolais in Villefranche sur Saône (France) in April 2012, NADELWELT in Karlsruhe (Germany) in May 2012, Riga (Latvia) in August 2012 and finally at Prague Patchwork Meeting in April 2013. Please take a look at MY ACTIVITIES to find out more about her previous and current personal exhibitions. If you like, please feel free to contact her via e-mail.